It may sound the simplest thing - but cleaning your house is one of the most effective things you can do to sell your home fast. A clean house and fresh home has a much better effect on viewers. How to clean my house? It's essential that the house clean and spotless. Start cleaning at the top of house and work down. Pay special attention to the kitchen and bathrooms, which need to be inviting and hygienic, clean all surfaces, use an old toothbrush to clean around taps and hard to reach shower fittings. Polish off all chrome to give a sparking clean finish. If you don't have the time or the energy to clean your home then it will be money well spent to get domestic cleaners in to really make the place sparkle. Consider getting in a domestic cleaning service, or known as residential cleaning services to clean the home, and specialist cleaners to clean carpets, the oven - and the windows cleaned too, inside and out. If the loo seat has seen better days buy a new one, buy new bath mats, put out hotel white fresh towels for photography day and viewings. Keep them away until the next viewing, it's easier than getting them washed in time. Strategically place a green or artificial plant or two. Consider some re-decoration to entrance hall, kitchen, bathrooms and master bedroom as it does give a fresh look to a property. Use neutral paint where possible. Repair broken fittings, consider new bathroom tiles or replacing tatty lino, and new kitchen doors can do wonders to smarten up a tired looking property. If you can't stretch to re-tiling in the bathroom re-grouting should bring it up new. As will putting in matching chrome fittings, replacing broken light bulbs, a freshly painted front door, ironed duvets in the bedroom, plumping cushions, taking down any heavy dark drapes, up-lighters in the living room for subtle lighting and strategically placed flowers throughout. Watch out for over-stuffed wardrobes, people do look in them to see how much storage is there, so have that over-due clear out and organise to sell-off, give away or pass on to charity shops things you no longer need. Finally gardens are now seen as an additional room, so make it feel like a great entertaining or relaxing space by weeding, adding garden furniture and planting a few all year round plants. In general green glossy leaves look good and are hardier plants. If you haven't got the time or the eye to know what to do to sell your home with tip top presentation then bring in the professionals. 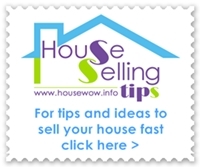 HouseWow, the UK's leading property styling professionals and CHSSP Certified Home Staging and Styling Professionals can provide support services to homeowners to sell property fast at the best price.